If you teach math, this is MUST. And if you don't teach math, this website is STILL a MUST! This site provides quick and fun math activities appropriate for all grade levels. What drew me to this site initially was the Star Wars challenge questions. One of the movies was coming out and I came across this on Twitter and my curiosity was peeked. I opened it up and was captivated! Star Wars characters were used in place of numbers in a set of 4 equations. I enjoy math challenges so I was easily hooked! and he has an entire YouTube channel devoted to helping kids learn math! 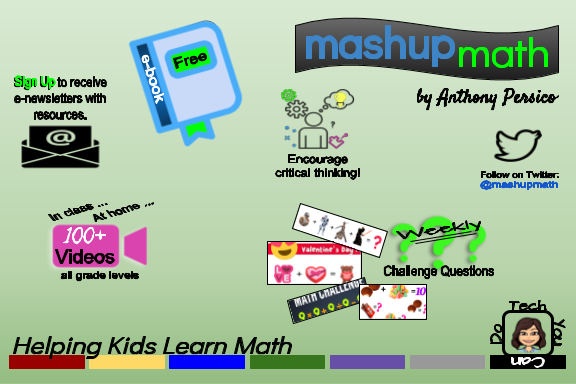 What I really, really like about MashUp Math is that it takes what seems to be "easy" math (addition & subtraction equations) and turns them into critical thinking challenges. And challenges that ALL our students - and we ourselves - can benefit from. But PLEASE! Don't stop at providing these worksheets to your students ... once you've got them hooked, challenge THEM to make some to share with classmates or other classes, or even share them outside your school! What an awesome "mashup" of tech & math & critical thinking & creativity?!?!? You could even go low-tech and have students hand draw out the variables OR go high-tech and have them use icons/images on line.